Terracotta & tealights are a perfect combination for creating a warm atmospheric glow. 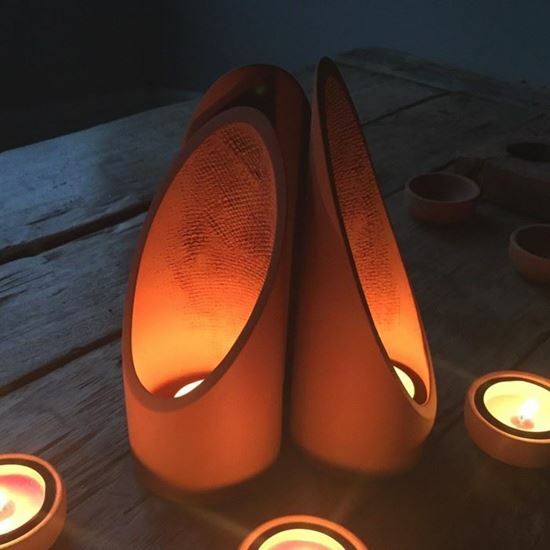 This terracotta tealight shade is illuminated by the flame whilst sheltering the flame from breeze. For use with a standard tealight, our simple terracotta tealight holders can be used indoors or outdoors. Textured interior for added rustic charm. Arrange in pairs or groups for added drama. Designed & made in the UK at our pottery studio in Newark, Notts.